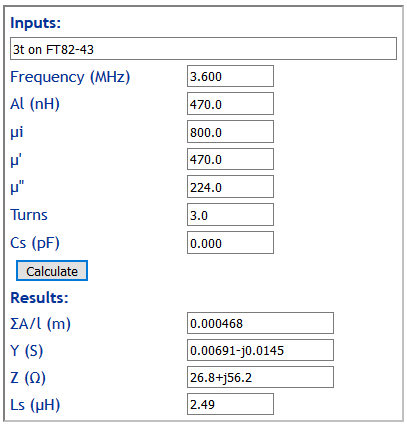 Let us calculate the magnetising admittance of the 3t primary at 3.6MHz. The core is a FT82-43 ferrite toroid. Gcore is the real part of Y, 0.00691S. If Yin of the loaded transformer is 0.02S, we can calculate the core efficiency as 1-Gcore/Gin=1-0.00691/0.02=65.4%, core loss is 1.87dB. Now as to whether 65% efficiency is acceptable is a question for the user. 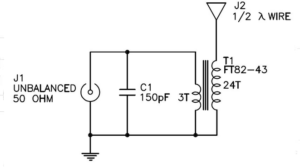 This is intended for QRP use, so 5W SSB telephony input is not like to damage it, and you could think that an inefficient antenna system doubles the benefit of QRP, QRP^2 if you like. If an efficiency target for the transformer is set at say 90% or better, it takes an 6t primary to achieve that on 3.6MHz. Gcore is the real part of Y, 0.00173S. If Yin of the loaded transformer is 0.02S, we can calculate the core efficiency as 1-Gcore/Gin=1-0.00173/0.02=91.3%, core loss is 0.39dB. Of course twice the turns are needed on the other winding, and the compensation capacitor will need review. Where do these designs come from? It seems 2t or 3t primary windings on #43 cores are very common which might suggest ‘designers’ have simply changed the core dimensions. The geometry of the core varies from size to size, so just as inductance and impedance are very dependent on magnetic properties of the material (complex permeability), the also depend on cross section area and path length. The calculator shots above show a metric, ΣA/l, which captures the geometry, the larger it is, the fewer turns for same inductance / impedance. ΣA/l for and FT240-43 core is 0.00106 whereas for the FT82-43 core discussed in this article, it is less than half of that at 0.000468 and so drives a need for more turns. Note that the next size core up or down in a series could have greater or lesser ΣA/l (m), there is no general rule that going to a smaller or a larger core requires more or less turns. 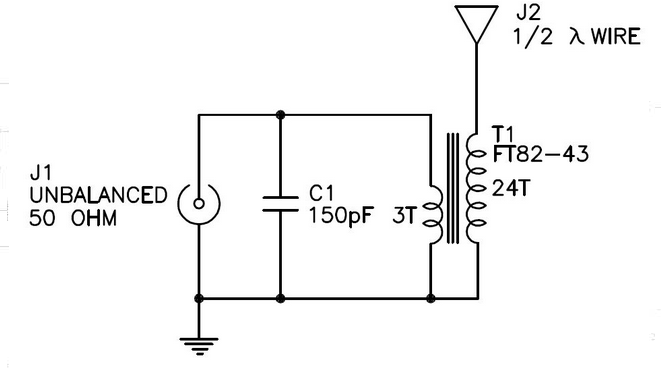 Some datasheets show ΣA/l or the inverse Σl/A . Well, in ham radio, everything works. But systems that work better increases the prospects of contacts.